Thanks to our sponsor, See's Candies, for this great holiday post! The holidays will be here before you know it (but we’d be willing to bet the power-planner in you is already outlining holiday fun)! Your upcoming holiday season likely includes planning for out of town guests, a class party, team celebrations, holiday performances, lots and lots of shopping, and last but not least, the holiday fundraiser for your school, club or cause. 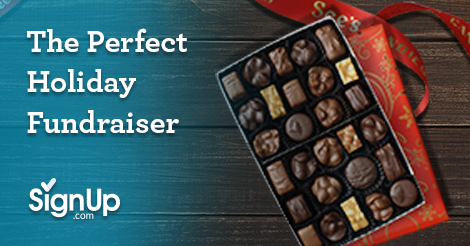 SignUp.com has your back when it’s time to plan and coordinate activities, and our sponsor, See’s Candies, is ready to simplify your holidays with a fundraiser perfect for gift-giving that’s also easy for friends and family to support. You could fundraise with wrapping paper, hoagies or coupon books, but why not fundraise with beautifully wrapped American made delicious candy that’s both easy to give and easy to receive? See’s Candies is the perfect holiday fundraiser! Your friends and family will find your See’s Candies holiday fundraiser enticing and very easy to support - we guarantee it! From See’s famous iconic boxed chocolate assortments to decadent chocolate bars to unique, classic-flavored lollipops (perfect for stocking stuffers), each sweet treat supports your fundraiser when you earn up to 50% of each sale. Friends and family will support your cause, while you sweeten their day! Since your friends and family have a lot of gifts to give anyway, they will be happy to buy those gifts from your fundraiser to support your cause. Remind them that these tasty treats come beautifully wrapped and packaged making See’s Candies the perfect holiday treat for teachers, officemates, clients, mailmen, neighbors - well, really anyone! And it’s the perfect hostess gift for all those holiday parties! Who wouldn’t love to save some time by skipping the madness of holiday retail stores and having several small gifts on-hand? Your colleagues, friends and family will hope to be on your holiday list next year once they taste these treats! There’s no need to leave your fundraiser out in the cold this year - See’s Candies is the perfect holiday fundraiser to raise the money you need for your cause. Visit the See’s Candies fundraising page for more program information, profit calculators and tools. Follow VolunteerSpot's board Fundraising Ideas on Pinterest.